I’ve heard you mention in the past that you didn’t become interested in firearms until you were in your 20’s – What was your first experience like? My first experience was at 25 years old. I was with my mom who was an instructor, and at the time we were shooting a pilot for a TV show. The producers wanted her to teach me how to shoot for the first time on camera. It wasn’t something I really wanted to do. I had been living in NYC for the past eight years, and guns weren’t something I got excited about. I wasn’t anti-gun, I was just disinterested. I was surprised when I hit the target on my first attempt, and then continued to do so on and on. It was a fun achievement, and everyone called me a natural. Little did I realize that I would be making this a career soon after. What was the first gun you purchased and why? A Sig Sauer Mosquito 22lr. What a finicky gun…A lot of instructors recommended it for me. Looking back, I could be completely sexist about them wanting to equip me with a 22lr, but I think it was a good advice. 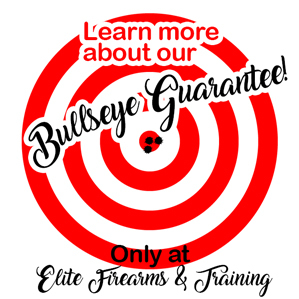 It helped me to conquer all of the shooting fundamentals without the fear of recoil. What tips would you give to women purchasing their first firearm? Take a class first. Most of my students regret buying their first firearm without previous knowledge. Employees at gun stores, husbands, boyfriends, and so forth will try to push either a revolver, a 22lr, or go to the extreme and recommend a .45acp because they think it’s most ideal, or is the best caliber for protection. It’s usually not. Do you prefer to shoot pistols, rifles, or shotguns? Pistols. It’s the first thing I learned on, so it feels the most natural. Hmm…That’s a tough one. I have way too many favorites. I will say my most valuable firearm is a Ruger Mark II, which was given to me by a stranger who found out it belonged to my mom before she passed away. It’s a really touching story. I discussed it on We Like Shooting Double Tap 03. What has been some of the biggest challenges you’ve faced starting your own business? Looking back, I don’t really know how I did it. Getting the word out about Elite, believing in myself that I could and still can accomplish this, and keeping that ambition going. They say if a business lasts two years, it will most likely survive. It’s been four years and I feel like I’m constantly changing things up, educating myself, and trying different tactics to keep things going. It’s not as easy as it looks. When you work for yourself, you’re never guaranteed a paycheck, work never ends at 5pm and Fridays don’t mean much. What has been your biggest accomplishments and/or proudest moment? Graduating college in three years with a double major, getting my first NRA credential (pistol) because my mom would have been shocked/proud. I was ecstatic when We Like Shooting asked me to be a permanent panelist (although something tells me that my inappropriate behavior on the show is going to come back and haunt me lol). I’m about to become a first-time home owner, and I can confidently say that I did it all on my own. I’m also proud of the person I’ve become. I feel like I have a unique voice in a male dominated industry and I haven’t given up on who I am to fit in it. I prefer to think I’m reshaping it, instead of it shaping me. What can someone expect from you as a firearms instructor? I’m a normal person. I don’t walk into class decked out in 5.11 gear with the intent on training you for the zombie apocalypse. I teach you what I think is most important for real world situations. I don’t want to be intimidating or egotistical. I know people are nervous starting out, because I was just in their shoes five years ago. I try to be as approachable as possible – I explain things in terms that would have made sense to me when I was first learning, and I add humor to my classes to make it enjoyable. What do you like best about being a firearms instructor? Knowing that you’re teaching someone how to protect themselves, and that one day it could save lives is priceless. That said however, I always wanted to do something that would build a person’s self-esteem, especially women’s. When beginners come to my class, they’re nervous and they doubt their abilities. Once I get them to that comfortable spot, however, you see how much more confident it makes them. It really is a great feeling knowing that you made them feel this way. What’s the biggest piece of advice for any shooter (grip, stance, sight picture, etc)? The biggest mistake shooters make is anticipating the shot and jerking the trigger. Snap caps and dry fire drills are essential to breaking these bad habits. As for a shooter who’s more advanced, don’t get too confident – That’s when mistakes happen. What advice would you give to women that are interested in learning to shoot, but doesn’t know how/where to get started? Sign up for a beginner’s class. Search online, read reviews, and even go as far as calling the instructor to make sure they seem like someone you’d be happy to work with. Most students think that you need a firearm before you start, but most instructors or ranges have rental options. As a woman in the traditionally male-dominated industry, how do you work to bridge the gender gap? For those most part, majority of men like to see women getting involved in the industry, but there are a few still stuck in their ways/beliefs. I knew this going into the industry, so I worked harder than most men. I made sure that I educated myself extensively so that I had answers to questions. I practiced and tuned my skill set so that my shooting spoke for itself. I also never bit my tongue when I felt I was being treated poorly. I think people set the tone for how they want to be treated, and what they allow will happen. I don’t want to be treated like anything less than an equal. Have you experienced any bias on the range? If so, what advice would you give to other women in regards to handling gender bias and/or pushing through the stigma? Unfortunately, yes. When I go to ranges, the RSO dumbs down their safety speech and watches over me closely. If I’m at a shooting event, most assume I don’t know how to operate the firearms. I know some men are trying to be helpful or they’re taking precautions, so I don’t get too upset. I usually just remain quiet and wait for their expressions when I show them that I know how to shoot well. As for pushing through, let it fuel your ambitions. Anytime I was criticized or not taken seriously, it just made me want to learn more and develop better skills. I think that’s why I became NRA certified in so many disciplines. Most of them I rarely use, but it gives me the credibility that so many others want to doubt me for. What do you think is the biggest misconception about women and firearms? That if you make it pink, it’s suited for a female. The problem with the industry is that there aren’t a lot of women engineering firearms, accessories, etc. Men are scrambling to know what women want, because it’s an untapped market, but none of them are really taking the time to find out what we really need. Last but not least, what is in your range bag? Besides the obvious, Uplula Speed Loader, Elevex shooting glasses (the cheap, thin, flexible kind…Seriously so comfortable and not extremely hideous), hair tie, and water bottle. I have yet to find ear pro that I love…Hence why I have an entire range bag dedicated to all the ear protection I own.